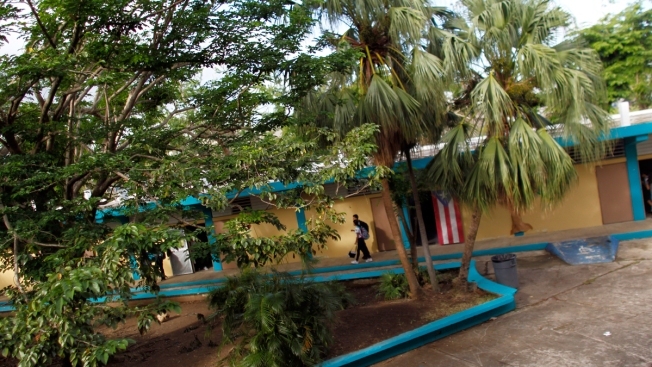 Students walk through the Sotero Figueroa Elementary School campus in San Juan, Puerto Rico, November 6, 2017. In the months after Hurricane Maria, between September and January, Puerto Rico's schools lost 26,674 students, according to the Department of Education. Many students are now returning for the new school year to a host of challenges, NBC News reported. Public schools are starting the semester with 305,000 students and 23,000 teachers, according to the Education Department; in 2017, enrollment was at 346,096. Meanwhile, as the Department of Education deals with a budget shortfall of $300 million, 266 public schools have closed. That's meant that some families will have to make longer commutes to schools that are further away from home. Schools that are taking in new students will be using trailers, paid for with FEMA funds, to support the influx. And roughly 128 out of nearly 850 operating schools still had teacher vacancies as of Friday, according to the Puerto Rico Teachers Association.